​March 8, 2018 -- On Thursday March 1, the North Shore Schools Board of Education continued its review of its 104,868,519 proposed budget for 2018-19, focusing most of its attention on instructional expenditures including regular education and special education as well as technology. Overall spending for next year is expected to increase $2.75 million or 2.7% over the current year while the proposed tax levy increase is 1.89%. ​Dear Great Book Guru, Next Tuesday, March 13 at 7:30pm all the candidates for Sea Cliff Village Trustee will meet at St. Luke’s Parish Hall to state their beliefs about Village governance and answer questions from the audience. It should be an exciting, informative evening. While I am waiting for the event to begin, I would love to have something interesting and worthwhile to read. A recommendation? The four candidates vying for the two positions that are up this year on the Sea Cliff Village Board of Trustees will introduce themselves and respond to questions from residents at the Sea Cliff Civic Association's annual Meet the Candidates forum on Tuesday March 13 at 7:30 pm at St. Luke's Parish Hall. Kevin McGilloway, running on the Civic Progress line is seeking a third two-year term while his running mate Henriette Rohl is seeking her first. 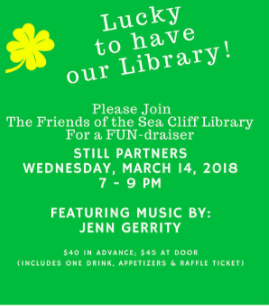 The Sea Cliff Open Government Party candidates are Liz Baron and Terryl Donovan, both of whom are looking to join board members Mayor Ed Lieberman and Dina Epstein as well as Deb McDermott who was the first to earn a spot on the board as an Open Government candidate last year. Trustee Robin Maynard, on the board since 2016, chose not to run for a second term. Also on the ballot is Charles Parisi who, tapped to replace long time Village Justice John Reali on the Civic Progress line, is seeking his first term and is running unopposed. 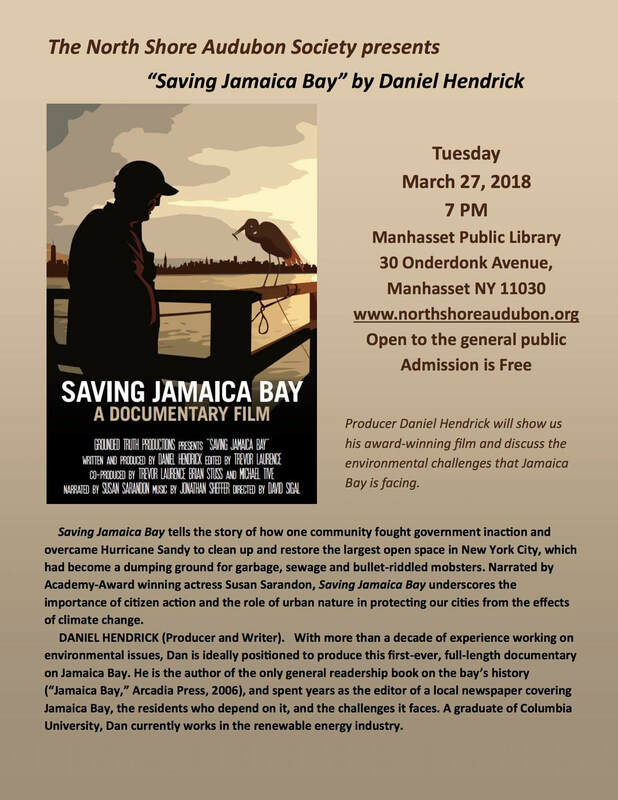 Below are responses of the Village Board candidates to questions posed by NorthwordNews. 1. Why did you decide to be a candidate for Village Board Trustee? I am running for Village Trustee because I love Sea Cliff and have a strong passion to unify our Village. Sea Cliff is vibrant and it is my aspiration is to continue the momentum, while assuring all voices are heard. 2. What skills or experience do you bring to the position? ​1. Why did you decide to be a candidate for Village Board Trustee? They’re bright and diverse. They’re male and female, mothers and fathers, young and old. They’re passionate about the Village and indignant about right and wrong. I strongly urge my fellow “Sea Cliffers” to come out and vote for Elizabeth Baron on Tuesday, March 20 from 12 noon to 9 PM at the DPW Garage at 66 Altamont Avenue. Our Sea Cliff Village trustees make a difference in our daily lives. Sea Cliff is a unique and very special place. We are fortunate beyond measure to live among so many volunteers whose contributions enhance our quality of life. As an attendee of many board meetings, I am grateful for the service of all the Trustees. Liz Baron and Terryl Donovan are two exceptionally qualified Trustee candidates who would be especially productive additions to our Board. On March 20th I will be voting for Liz Baron and Terryl Donovan for Board of Trustees. Sea Cliff residents are fortunate to have a real choice in the upcoming Village election on March 20. 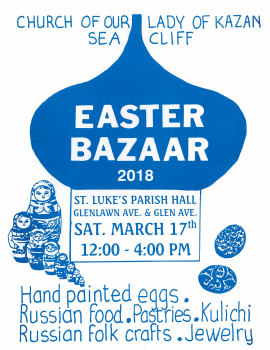 Come and enjoy the annual Easter bazaar of the Church of Our Lady of Kazan! We’ll have home-made pirogi and delicious borscht, and don’t forget to have one of our wonderful desserts! For those of you in a hurry, we have a take-out option. But the bazaar is not just about food. Add to (or start) your collection of Russian Easter eggs or lacquer boxes! And be sure to look at our jewelry and gift items. The bazaar is on Saturday, March 17th from noon to 4 p.m. It will be held in the parish hall of St Luke’s Episcopal Church, on the corner of Glenlawn and Glen Avenues, Sea Cliff. (St Luke’s is at 253 Glen Avenue, and the parish hall is around the corner on Glenlawn Avenue.) The bazaar information line is 516 468-1579. Rabbi Andrew Hahn, proclaimed the “Maestro of Kirtan” by Rabbi David Ingber of NYC’s Romemu Center, presents a concert onSaturday, March 24 at Congregation Tifereth Israel (CTI) in Glen Cove. The 7:30 p.m. concert by the Kirtan Rabbi is free; the public is invited share this joyous, participatory musical event. Kirtan, singing based on call and response, is a form of chant developed in India to heighten participation and communal feeling. An exhibition of artwork by long time Sea Cliff Resident Azita Ganji, who passed away last year, is now on display at the Sea Cliff Public Library through the end of April. Entitled“Spring Again: A Retrospective," the exhibit features a variety of works that reflect the artist's love of nature and brilliant hues.